NL542 ultra high pressure hose is constructed with a Fluoropolymer innercore of non-conductive PFA that can be used for a variety of compressed gas cylinder filling, oxygen, nitrogen, Co2 Carbon Dioxide, and certain outdoor helium applications where effuse is permisible (a PFA innercore is not for use with hydrogen or indoor helium as it can effuse into the atmosphere, only an ETFE innercore (different hose series, not NL542) may minimize effuse of helium or hydrogen. NL542 can also be used for breathing air life support packs, hydraulic phosphate ester transfer, certain high pressure paint spray fluids (consult factory), epoxy/adhesive systems, and certain high pressure food grade applications. 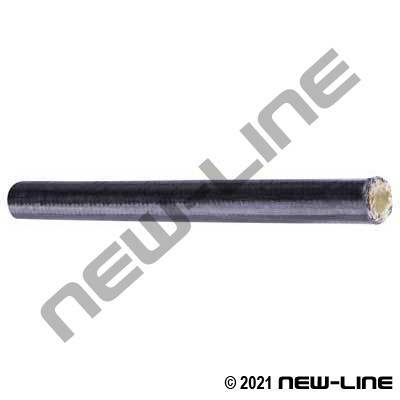 NL542 incorporates one braided layer of high tensile kevlar fiber and one layer of stainless steel. This engineered construction reduces weight and improves bend radius while increasing burst pressure. An integral, abrasion resistant, smooth Hytrel cover protects the exterior braid. All lengths are factory coupled and certified. For gas applications, assemblies are to be tested with nitrogen to 6000psi and, for fluid transfer applications, to be hydrostatically tested to 9000psi. For applications where static electricity is an issue, a different hose with a static conductive tube should be used. Consult factory on all critical applications. Typical Fittings: *This is a CRITICAL PRESSURE HOSE, follow assembly procedures carefully. N542xx 2-piece stainless steel permanent crimp fittings. Construction: Tube: PFA tubing. Cover: Smooth, black Hytrel protective jacket. Reinforcement: Kelvar braided layer, interlayer PTFE tape and stainless steel braided layer.